Community: The name of a much-loved television show (which I’ll admit to never having seen–sorry, amb!) and also a support system found in the blogosphere. I’ve mentioned here before how gratifying it’s been to find others who are as crazy for all things food as I am. I’ve also met folks with completely different perspectives (you listening, wdydfae? 😉 ) that I can learn from. Because I focus on food and drink, my community is mostly (but not entirely, Miss Fannie) made up of food bloggers, and though there are too many to list, you know who you are. You’ve inspired me with your recipes, photos, ingredients, and general celebration of all things culinary. It’s also been rewarding to see this community extend to deLizious’ facebook page. Started purely for business purposes–potential clients should see that I’m out there trying new foods, restaurants, recipes, right?–it’s also become another point of connection for fellow bloggers. 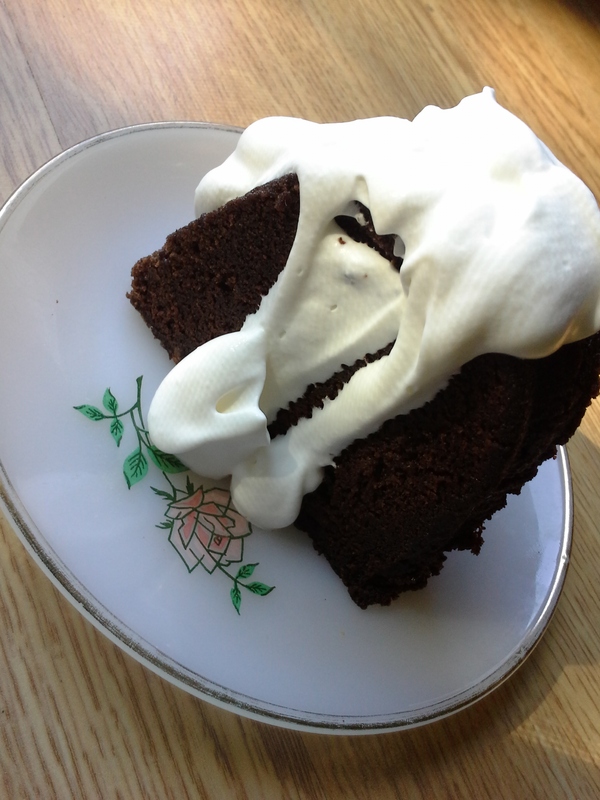 Which brings me to the first of the two recipes I have for you this week. Some months back, a blogging friend and facebook contact (hi, Dave!) 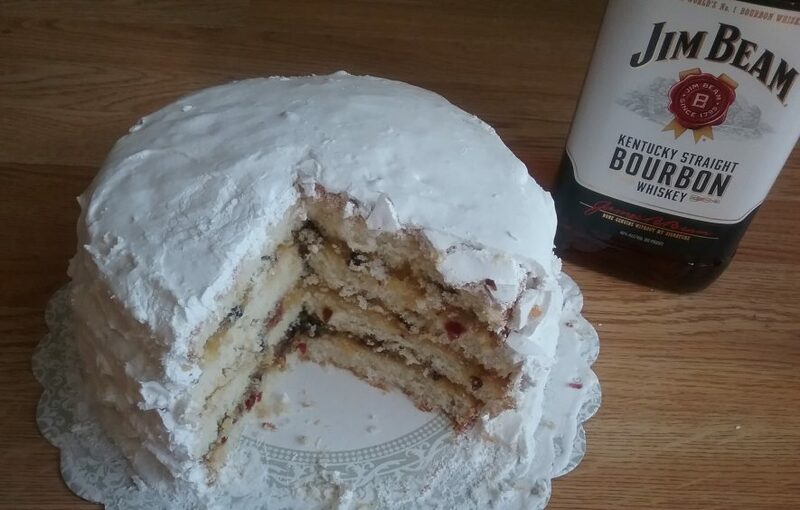 posted a photo of a bourbon chocolate cake a friend had made for his birthday. The image grabbed my attention and stayed with me. 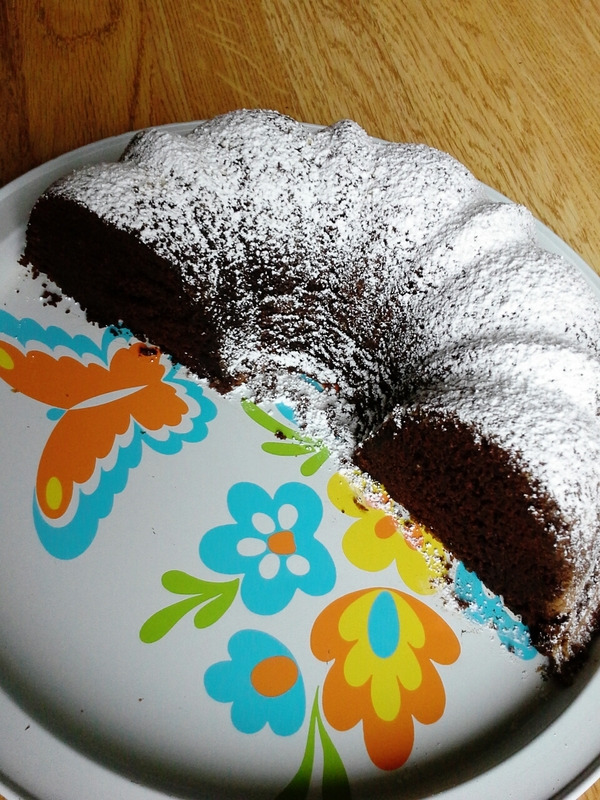 A week or so ago, I mentioned that cake in a comment response on his blog, and he surprised me by starting a facebook conversation with me and the cake’s baker, asking her to share the recipe. And she did. (Hi, Courtney!) I’m giddily grateful to Courtney and Dave for their generosity and willingness to connect. Enough with the ramble. Here is that cake! Easy to make, it’s dense and boozy and chocolatey. We gobbled up half the night it was served and have been working on leftovers since. Letting it sit, I’ve found, is an excellent move as the cake gets boozier and fudgier by the day. I jumped on this candy corn bandwagon quicker than you can say “trick-or-treat,” combining 1/2 cup candy corn and 1 1/4 cups vodka in a mason jar. 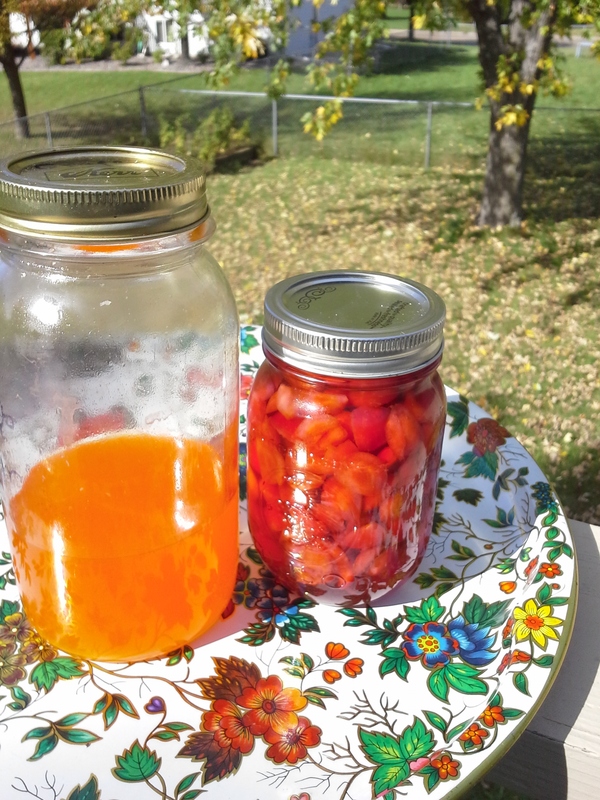 “Brewing” time is recommended at 4 hours up to overnight, and I gave the jar a good shake often as I wanted the candy corn dissolved in time for our evening party. Picture a kid shaking a snow globe–that’s where I was, watching the candy corn slowly dissolve as the alcohol ate the sugar. Five hours later, the resulting liquid was day-glo orange and stunningly beautiful. 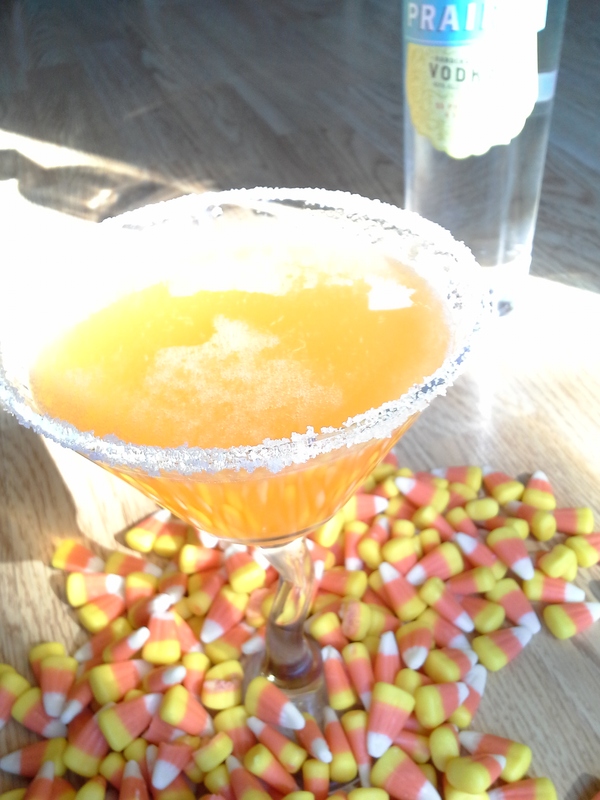 Candy corn vodka hanging with crabapple liqueur. Come back in a few weeks for the liqueur unveil. Combining it with lemon juice and Grand Marnier (subbing for Triple Sec), along with ice as instructed in the recipe left me with a powerful strong beverage, highly drinkable with an extra shot of soda water. (Thank you, soda siphon!) I hadn’t realized until finding the recipe link online that this was a “pucker-tini” and have decided since that I’d use 1 to 1/2 tablespoons lemon juice instead of the 2 next time around. Crazy-good cake and cocktails made for an evening to remember and I owe it all to connections and community–online and off. Many thanks to all of you for your follows and Likes and comments and reads. I’m honored and thrilled to be in your most excellent company. Candy corn cheers to you!